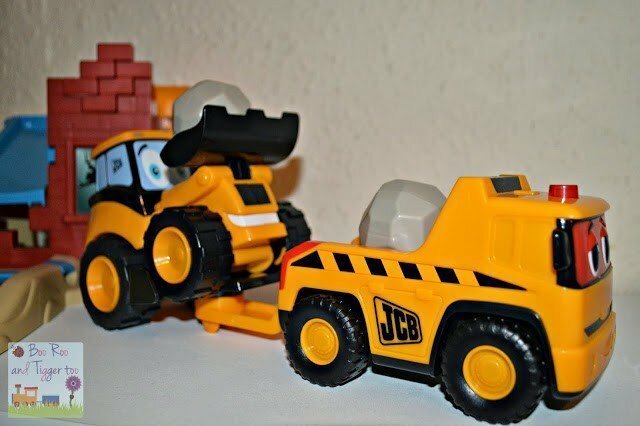 My 1st JCB is a range of toys that allows children from 12 months+ into the amazing world of diggers, trucks and demolition. 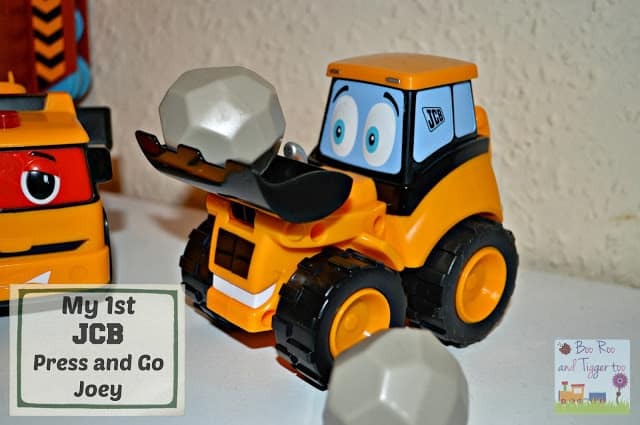 Press and Go Joey JCB and Talking Rocco Rescue are just two of the toys available in the range. Tigger was introduced to the world of JCB back in July at an event we attended, where they had set up a bedroom with all things JCB in it (honestly I thought I was never going to get him out of there). Joey is a popular member of the My 1st JCB Team. He is perfect for all sorts of construction work and just loves getting dirty! Press down his cab and watch him go! With a real working scoop and two rocks he can make himself useful by moving his cargo around. Rocco is a truly magnifico rescue truck! He’s great at fixing engines and a whizz at towing diggers. Always stylish, never panicked Rocco is there for his friends whenever needed. Talking Rocco says 5 fun phases, I’m ready to rescue! With a flashing light he alerts those around him that he needs to get to his next pick up fast. The folding tow arm comes down to enable other JCB’s to hook on and be towed away, the towing bar also rotates so hold on tight as he swings around corners. Requiring 2x AAA batteries which comes supplied! (I could hardly believe it, a toy needing batteries and they have come supplied…fabulous). 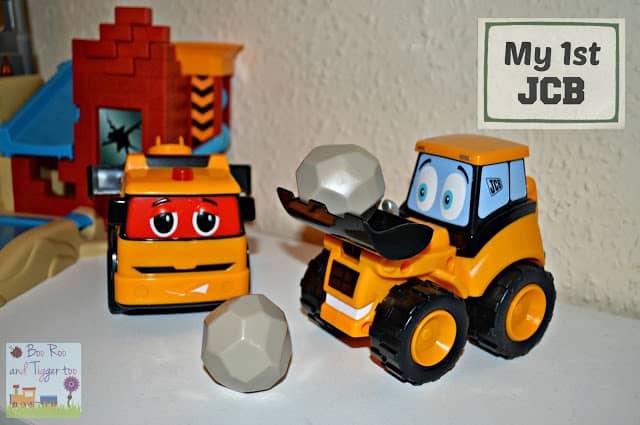 The two new trucks have allowed Tigger to expand his My 1st JCB toy range, having previous gained the My 1st JCB On Site Charlie Crane Playset . Whilst the trucks were larger than the ones included in the playset this did not bother Tigger. The Press and Go Joey JCB has had Tigger in stitches, pressing the cab down and off he whizzes he just finds it hilarious, especially if it manages to crash into the furniture or better still someone’s feet. Talking Rocco is hit with regards to his useful tow bar and flashing light however, due to Rocco’ accent Tigger is unable to repeat the phases as he doesn’t understand what is being said. Considering this is aimed at children 12 months+ a strong clear accent would have been better as children love to copy their toys phases and noises. 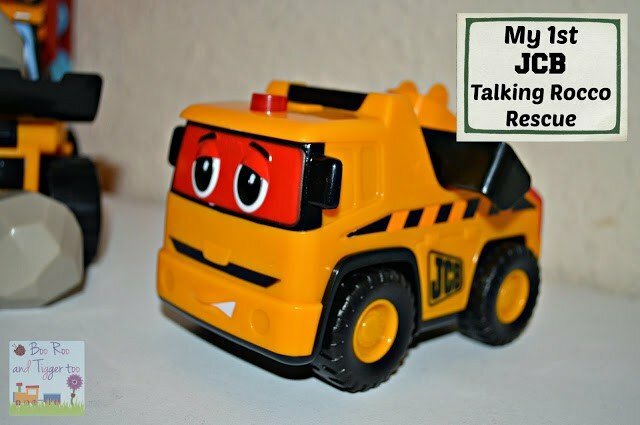 Disclosure Policy: We received a My 1st JCB Press and Go Joey JCB and My 1st Talking Rocco Rescue FOC for the purpose of review.